A re-energized Republican Party is storming Washington following its election success armed with an ambitious agenda to stop and roll back President Obama's liberal agenda. 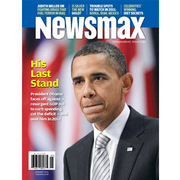 Newsmax magazine's special report, "Obama's Last Stand: The Showdown," takes an in-depth look at a GOP determined to slash spending, cut taxes, reduce the deficit, replace Obamacare, launch investigations — and most significantly, the GOP's secret plan to take back the White House and make Obama a one-term president. Make no mistake, Obama and the GOP are heading for a showdown in Washington, with Republicans drawing battle lines against an unpopular president — and Obama facing his last stand. This issue of Newsmax magazine also features "12 Republican Stars of the Freshman Class". Who is the 112th Congress — 94 newbies in the House? Sen. Rand Paul and the "real force for change in America"
Four GOP targets: ACORN, EPA, Black Panthers, and "czars"
The nation's biggest power brokers and their "fleeting loyalty"
Ben Stein: Six bold moves for the U.S.
Is the government making you fat? What ever happened to Bob Dornan? 'Obama's Last Stand' Newsmax Magazine January 2011 A re-energized Republican Party is storming Washington following its election success armed with an ambitious agenda to stop and roll back President Obama's liberal agenda.